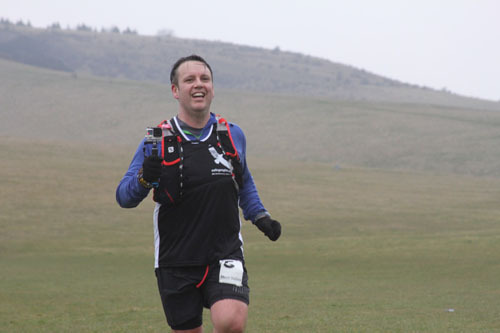 Last year I had a rude introduction to trail running thanks to the Longman 18.5m Falmer Run (note to self: publish the bloody blog post about it) where I slogged through the mud and hills admiring the stunning scenery across the South Downs. I loved every minute of it, especially the bits where I got lost (both times misdirected by marshals *grrhhh*). 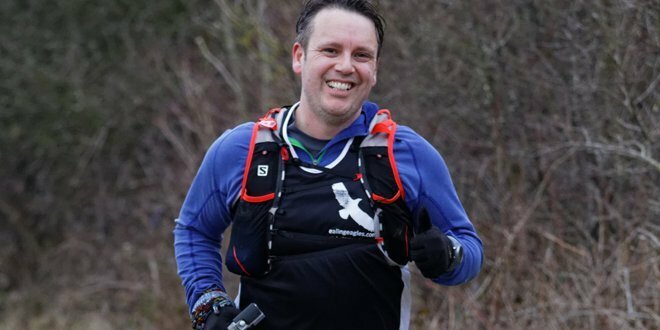 My grin widened with every bonus mile, with every slice of cold pizza, with every slurp of flat Coke, and every time I wrestled with the mud to keep hold of my shoes. Who needs to keep chasing ever faster times when you can enjoy the experience of the English countryside? Stunning views, wildlife that is wild, technical trails, steep hills, and copious amounts of mud. The lure of the trail is stronger than the pounding of the tarmac. So I looked around for something similar. 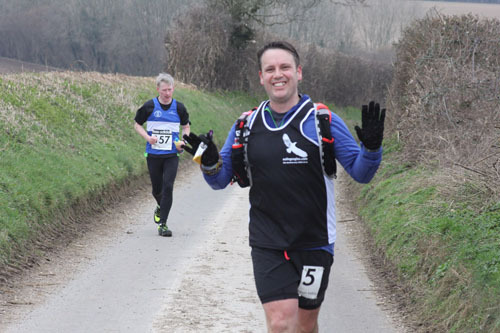 I found the Meon Valley Plod. It seemed to tick all the right boxes. Trail running, some hills, well organised, plentiful marshals, food & drink, and within driving distance. I signed up straight away. Mrs RunningDan asked where I was going. I described it as a gentle soirée over the beautiful South Downs and discreetly changed the subject before she could ask any more questions that might cause me to bend the truth even further. I’ll get round to publishing my blog post about last year sometime. It’s not written yet. I’m still suppressing the memory. At one point I was leaping through shin deep muddy puddles, blood flowing out of deep bramble scratches on one of my mud coated legs, and wildly singing the Muppets “Mahna Mahna” song out loud as I bounded past startled runners and marshals. However, I loved it. Every wet and muddy and windy second of it. Loved it. Great organisation, lovely marshals, and amazing aid stations. Naturally I was back for more again this year and I made a half-hearted attempt to attract some Eagles to join the fun. However, I knew the pool of trail running Eagles is relatively low and that the majority would be slaves to their P&D marathon training plans. So I headed out at stupid-o-clock by myself to the race HQ, which this year had moved to the Queen Elizabeth Country Park. Plenty of event parking and a good setup for race number collection etc. I was early (always!) so picked up number 5 and retreated to the car to get ready. I took the opportunity to walk the first hill and take in the surrounding countryside. I can see why Queen Elizabeth parkrun regularly pops up in the top 5 hardest parkrun courses in parkrun tourist discussions. Runners and supporters were arriving in full flow so I filmed for a while with my GoPro. It’s still something that I am getting to grips with but continue to practice shooting stuff and then editing it down later. I haven’t got round to publishing my video yet but I’ll add it in here at some point. However, I did bump into another GoPro armed runner and he has a great web site with some equally great films. Highly recommended. The new race HQ allowed for a wide start line and everyone was soon powering their way up the first long hill. I had no pace or finish time in mind other than it would be nice to finish under 4 hours. I adopted a run / walk strategy for the uphill sections (some you had no choice anyway) and made up time on the flat and downhill sections. It wasn’t long before we exited the trails onto a country road but things immediately looked wrong as I could see faster runners steaming across the junction in the opposite direction. It turned out that some idiots had played around with the course markers and twice sent the lead runners off in the wrong direction. A real shame but hats off to the lead runners and the race organisers for the way they dealt with the results afterwards. Running the South Downs exposes you to changeable weather, with sheltered sections of warm sunshine soon swapped for exposed blustery ridge lines. The views were stunning though and the ever-present marshals and aid stations were fantastic. As with all long races I had my high & low mood points. I remember a beautiful bouncy forest section that saw me fly downwards overtaking everyone but then rocky trails where the wind always seemed to find a way to push me backwards. That’s the real challenge though. 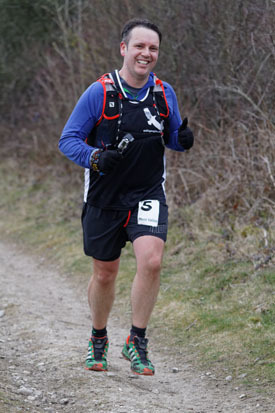 Dealing with the tough sections, fighting with the urge to quit or reduce yourself to a walk, to look the conditions in the face and just keep running. This year I kept my walking to an absolute minimum and so even the toughest sections saw me reeling in runners who had earlier overtaken me. It helped that conditions were dry this year and there were no quagmires to wade through. In truth I probably wore the wrong shoes, opting for trails shoes when some cushioned road shoes would have been fine. The last few miles were in sight but I couldn’t see any other runners ahead. I had overtaken enough to suddenly hit a pocket of nothingness. Thankfully the ever-present marshals made sure I was on course and I hit my stride again with the beauty of the countryside around me without anyone to be seen. I felt like I could have kept on running like this forever but the familiar shape of the first hill approached and I was bounding down the long downhill to home and across the finish line. A great event from a great team. A medal was put round my head, a bottle of water passed across, and I stood cheering in finishers behind me taking their glory moment. The closeness of the car allowed me to switch to some warm clothes before heading back to HQ for some warm soup, burgers cooked on the BBQ, and a slice of home-made banana cake. Heaven.